thank god i have a day off from work tomorrow and so i can go back wearing these. Are these trainers from converse? if i don't wear sneakers then i wear heavy steal-toed army boots. all other shoes i simply find more or less uncomfortable! You know my favourite shoes are Doc Martens, because they are comfortable and i like this kind of shoes very much. I'm a HUGE boot wearer! As some may already know, I own Docs (naturally!) and a whole range of other boots. These are my latest edition! (an opportunity to show off!) and are called Creeper Boots (with straps) made by Demonia. Ebay sells 'em! i guess if you post a direct link to an image uploaded elsewhere, it's displayed here in the same size as the original. i don't know any trick to do it afterwords, sorry. some photo sizes offer resizing when you upload over there, meaning that the photo is resized in the uploading process (like www.imageshack.us). some other sites might give you "ready made" direct links with different photo sizes after you've uploaded your pics there. so i suppose it depends on where you're uploading your pics. LUV the boots ~*CherryRed*~ ! I just recently got myself some doc's 20 up black flat, and also 20-up heeled.. I can't wait to wear them... maybe to the next Cure Concert.. ?? .. and hopefully we'll BE there wearing our fav boots altogether! Hahaha Scatcat... scatdodat! (lol, don't mind me, just thought I'd try some beatniking!!) We shall most def. have to wear our BOOTS to the next greatly anticipated Cure Tour - the BOOT GRRLS are in town! HA!! Can't wait really, I'm literally falling apart at the seams for lack of live Cure! the DVDs I have are some respite, but alas, I feel a need for the real thing! I'm so glad to see someone else buy a pair of 20up Docs! I'm guessing they're not steelcap matey? I persoanlly can't wear non steel cap Docs anymore... once you've owned a pair of steelcaps, you'll never look back! I reckon they just look better once they're all worn in - thats my opinion anyways! Can you post a photo of your high heeled ones, as I'm a nosey cow!!! 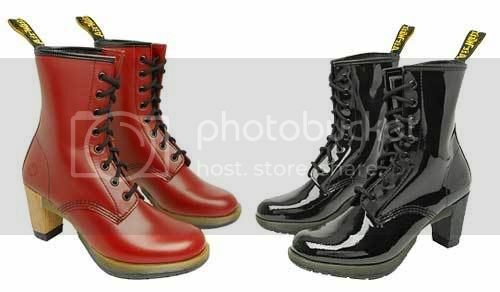 I think I know what style you may have, but then Doc Martens have produced SO many new lines these days it's hard to keep up with whats out there! Oi, I found these Docs... how cool are they!?! Hmm, can I afford another pair of BOOTS so soon?! I've bought today these nice Reebok SH311. They're very similar to the one Robert is wearing in the Friday I'm In Love video, although the shoe laces are black (white in the video) and the tongue is smaller. For the past 20 years, Dr Martens 1460, 8 eyelets boots, flower decorated ones.